An investigation by the USAF during the late 1940s known as Project Sign concluded that UFOs are interplanetary spacecraft. However that report was classified as Top Secret and ordered destroyed. We only know of its existence because Edward J. Ruppelt, former head of a USAF program that investigated UFOs, saw the report and wrote about it in his classic book The Report on Unidentified Flying Objects.1 Since then, many more documents related to UFOs that were once secret have come to light. Some have been released under FOIA provisions. Others have been voluntarily disclosed. At the time this article was written, Canada, the United Kingdom, Sweden, France, Brazil and Denmark have all released numerous UFO related documents. Unfortunately, the information volunteered so far provides no proof of extraterrestrial visitation. However it does prove that past denials by governments of their involvement in the UFO phenomenon were false. There is no longer any doubt that there has been a widespread UFO cover-up. Most ufologists would also agree that the best evidence is still being suppressed. For example, Air Force pilots and film crews have captured UFOs on film, but no footage has been released to the public. In 1955 while stationed at Edward Air Force Base, USAF astronaut Gordon Cooper was supervising the filming of a precision landing facility for F-86 fighter jets. Suddenly a UFO flew in directly over the camera, deployed tripod landing gear, and landed on the dry lake bed. Cooper describes it as a typical saucer, metallic and double lenticular in shape. His film crew began filming the craft, which almost immediately lifted off, retracted its landing gear, and climbed out of view at a very high rate of speed. Cooper sent the film for developing and reported the incident. The following day a USAF courier picked up the film for transport to Washington, D.C. where it has since remained out of reach of civilian investigators. Cooper wasn't able to personally view the film before it was picked up, but he did get a chance to hold it up to a window and confirm that it was good. When Cooper was asked if had been able to keep in touch with anybody about it, he responded, "How would I keep in touch with anybody about it? There is no way within the military or the government to keep track of something that is classified unless you are directly involved in it. "2 Civilian films have also been confiscated by the authorities and never returned. 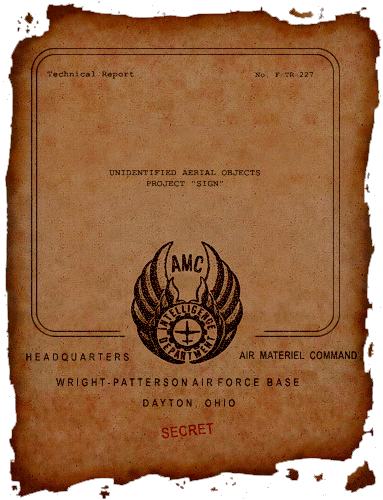 Reports leaked from inside sources tell of UFOs being tracked in space by modern military RADAR, but those reports are conspicuously absent from any of the disclosed files. Last but not least, there have been crash retrieval operations involving downed or damaged UFOs, yet no physical evidence has been offered for inspection. To be fair however, when government agencies are involved, secrecy may be the best policy. For example, publicly disclosing information could inadvertently reveal procedures, equipment, locations and personnel to potential enemies. This can happen because the resources used to investigate trespasses by foreign military aircraft would also be the same ones used to investigate UFOs. So even if the UFOs themselves are not a threat to national security, revealing how we were able to come to that conclusion could be. Similarly, it is likely that some UFO reports are the result of secret but friendly military testing. Naturally such tests would pose no threat to national security, yet keeping them classified would be entirely understandable. The necessity of such secrecy means that the best evidence will continue to be suppressed for an extended period of time. Eventually, like most of the disclosure so far, it will become inconsequential for governments to release it. The only way to speed up the process is for governments to establish a diplomatic relationship with the UFO entities, or for the aliens themselves to become less secretive. One of the points made by skeptics is that if the government knows UFOs actually exist, it would be impossible for them to keep it a secret. Something would eventually get leaked. What those same skeptics often overlook is that such information does exist. In addition to Edward J. Ruppelt's disclosure, there are the controversial MJ-12 documents. Prepared for US President Dwight D. Eisenhower on November 18, 1952, they describe covert operations focusing on UFO crash retrieval operations. Another popular source of leaked information is Robert Lazar who claims to have been an employee at Area 51 where he worked on the propulsion system of an alien ship. Other leaks include testimony from former USAF personnel who had knowledge of the Roswell incident. Others have come from people inside the United States space program. For example, astronaut Gordon Cooper revealed that in 1951 while stationed in West Germany, his F-86 Sabre squadron was scrambled to intercept several saucer shaped UFOs. Scientist Paul Hill, who among other things was a member of the NASA Office of Advanced Research and Technology, observed UFOs on two separate occasions. From his considerable technical expertise he was able to conclude that they must have been of alien origin. Video Documentary, Out Of The Blue ( Hannover House 2004 ), interview with Gordon Cooper. The document in the artist's rendition ( top left ) depicts the charred remains of a Top Secret document.